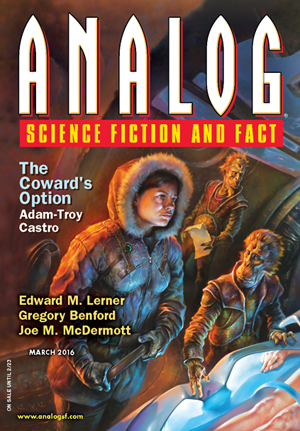 My latest guest editorial for Analog is in the March 2016 issue, which just came out. It concerns elections, voting, and maintaining our democratic self-governance in the United States. This is a topic near and dear to my heart as I spent 25+ years as an election lawyer. Several experiences that made the biggest impression on me, however, took place not in a courtroom but rather in my own local polling place where I serve as an election officer whenever they need me. Actually, they almost always need me as there is a shortage of people willing and able to volunteer for one day to help local officials run the polling places. It’s such a worthwhile thing to do that I hope you’ll all give it some thought if you are able to devote a day to helping our country maintain democracy. Lastly, I just gotta say, man-oh-man this guest editorial writing gig never gets old! On Tuesday, I’ll arrive at my local elementary school before 5 a.m., which is a major undertaking for a morning-challenged person. Since I’ll be on my feet for significant stretches with very little time for breaks, I’ll bring along a spare pair of comfortable shoes, caffeine, lunch, and snacks. I’ll help set up the voting machines and electronic poll books, put up signs, etc. Everything must be ready for those morning people who will be waiting in line when the polls open. I’ll spend twelve hours checking people in to vote, answering questions, directing people to the next available voting machine, handing out I VOTED stickers, and such. When the last voters have left after 7 p.m., I’ll remain on the job with the other election officers to verify vote tallies for every race and bond referendum, shut down and seal the equipment, and pack up. The last time I did all this, the only time I saw the sun that day was when I assisted in bringing the portable voting machine outside to the curb so that a mobility-impaired driver could vote. I volunteer to serve as an Election Officer at nominal pay for several reasons, chief among them is my belief in the virtues of our democratic form of government. Sometimes we Americans take it for granted, looking at voting as yet another on the ever-lengthening list of things to cram into a work day. I find that attitude both reassuring and alarming. It’s alarming in that it can and does lead to low turnout, reduced personal investment in our democratic institutions, and correspondingly lower support for elected officials who are trying to do what they believe is best for people. It’s reassuring in that our electoral system is so entrenched over so many generations that we have the luxury of not thinking much about it because it’ll just be there for most of us. But I can never think this way, not after checking in 18-year-old first time voters or handing an I VOTED sticker to a woman older than me who lived most of her life under Soviet rule and only just became an American citizen in 2012. Actually, so many people worldwide have no meaningful ability to participate in the selection of their leaders. And when democracy does come to a nation for the first time, it isn’t easy or automatic. We take our fancy electronic voting machines, many with touch screens, for granted. In fact, we’re indignant if we don’t have new, perfectly working equipment, and enough of it to reduce the wait. We also take for granted our ability to move about easily and get to the polling place, or to send in an absentee ballot. It isn’t like this everywhere. There are many, many places where the obstacles to voting include the lack of electricity, poor transportation, and no tradition of peacefully and safely casting secret ballots. The least we can do, and I mean all of us, is to show the rest of the world that we value our precious democratic ability to vote. Plus there is more that we can do. Counties, cities and other local governments are frequently short-handed when it comes to Election Officers. If your situation is such that you can take election day to serve your community in this capacity, I urge you to consider doing so next time around.